I’ll be tabling with the Topatoco table at the New England Webcomix Weekend in Easthampton, MA November 6th & 7th. Buy tickets now, and see more info at NEWW or on their twitter feed. I’m not sure if I’ll have any Spacetrawler merch yet, but I’ll have Little Dee and possibly Bruno stuff there. Speaking of Merch, I know I don’t have anything to offer yet, and so it’s hard to support me. But if you’re enjoying this strip, there are ways you can help. 3. 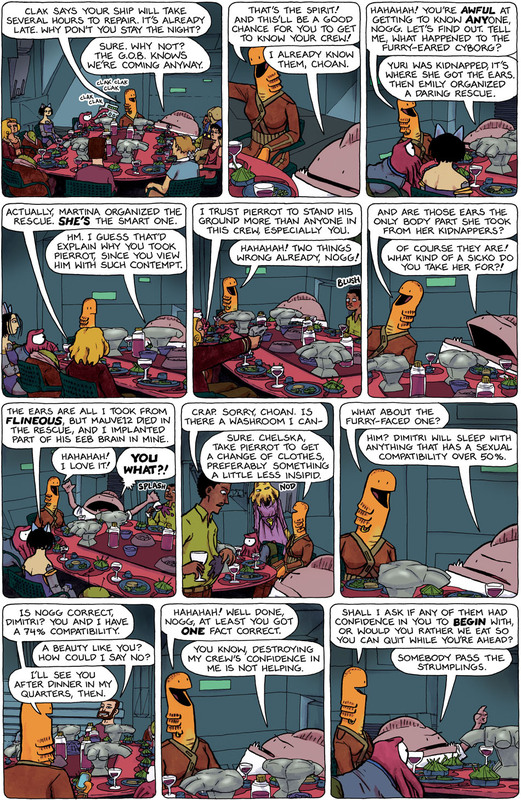 Link to Spacetrawler in your favorite bulleton board, chat room, website, etc. 4. Purchase books and merchandise from my other comics, “Little Dee” and “Bruno” from Topatoco. And on the topic of links, a couple of shout-outs. I don’t know who’s been doing it, but someone’s been keeping up the list of techniques Spacetrawler uses over at TV Tropes. Awesome! Thank you! Also, thanks to whoever it was at Amherst College who linked to me. Ah, Amherst… my old stomping ground, I do love thee. You’re welcome for the TV Tropes links. And I know I’m not the only one maintaining that page. This latest page makes me like Choan quite a bit. I like that about the comic: The clear majority of the characters are interesting and sympathetic, even the ones who I would hate to spend any time around in real life. One hopes Choan’s heinous crime wasn’t post-coital cannibalism. hehe poor Nogg! at least Dimitri didn’t let him down, and also scored again! Great scene, Chris. I love the fact that Yuri took part of an eeb brain. Verrry interesting! Hmmm… Strumplings> Could those be some sort of cross between strudel & dumplings? Also, I’m getting a furry Illithid vibe from Chelska, and I find that really delightful. Thanks, @Metaphizzle! I think it’s super neat. Thanks, @Typo! I’ll fix that as soon as I get a chance. I love Emily in panel 5. Why just point at someone when you can point at them with a gun? What are the grey things that look like a cross between a hacked off bit of Michelangelo sculpture and stone hands with cut-off fingertips? My guess is they’re food dispensers. Please fix the last panel: “Quit while you’re ahead.” Thanks. @Matt, exactamundo! Food synths. To make sure there’s something for everyone’s digestive system. @Ty, considering that the GOB is now hunting them, they really need to watch what they eat. Before it eats them. I mean, if Strumplings are some sort of cross between strudel & dumplings, then imagine what they would get if they ordered noodles. Noodles: a dangerous cross between ninjas and poodles. I have a sneaking suspicion that things are about to get Calrissian… I hope I’m wrong.